In the last installment of How to Make a Genre Show I took you up to the point in the show-creation process where you had detailed outlines (approved by the network!) for the episodes of your series. 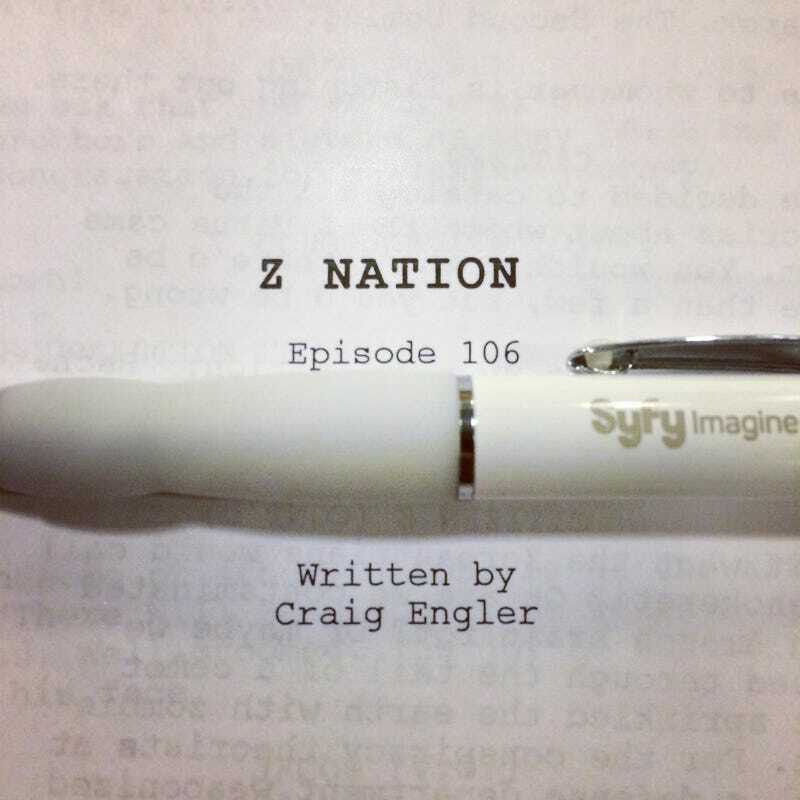 Now it's time to take that outline and turn it into a script — which I did, when I wrote episode six of Z Nation, which airs tomorrow night. I've previously co-written two TV movies from relatively scant outlines and those scripts were painful to write. The ideas were solid but when it was time to flesh out our meagerly detailed acts into 100 pages of compelling writing, the gaps and shortcomings of our story structure became hideously evident. Thank god I had an awesome co-writer to help sort it all out. By contrast, working from the detailed outlines created in the Writers' Room makes writing a TV script much easier. Since we'd already broken the plot, character arcs, themes, etc., I knew exactly what I needed to do and could actually focus on just writing the sucker, which was utterly refreshing. In TV you generally spend way more time preparing to write than actually putting fingers to keyboard. And if you do run into problems, a quick chat with our showrunner or a fellow writer could solve the issue. That's not to say it was a breeze. Interestingly, writing my first script for Z Nation was tricky because of the unusual fact that we didn't have a pilot script...or any other scripts for that matter. I was in the strange position of writing episode six in a series where episodes 1-5 hadn't been written yet. That made for some unexpected challenges. For instance, while I knew the continuity for the season-long plot and the broad strokes of the character arcs, the nuances of our characters' lives hadn't been developed yet. I couldn't reference, say, a running joke between our gang that started in episode two because there was no episode two. And if the writer in episode five got to the end of his script and suddenly decided to leave one of our gang with a bullet wound, I wouldn't know about that until after I'd written mine. Sure, we talked ahead of time about all the stuff we planned to do, but one of the joys of writing is that you find new, interesting moments as you go along. And your characters are often revealed in those moments. On the other hand, nothing in the first draft of any script is set in stone. Most showrunners rewrite scripts pretty heavily to make sure everything has the same tone and voice. So while I was missing some elements I'd like to have played off of, I was also free to experiment knowing that if I did anything really wonky, it'd get smoothed out later on. Side note: All scripts are also eventually subject to the hard realities of production, which can lead to many last-minute changes (and sometimes seismic alterations). If you write a scene about your characters coming across an abandoned tank and you later find you can't rent a tank — or the tank never shows up, or the tank shows up and it's a firetruck — say goodbye to that tank vs. zombie scene as well as all your snappy Patton- Rommel dialogue references. A first draft is just that...a draft that will likely change significantly up until the last possible moment before shooting (and also during shooting, and even after shooting thanks to the magic of editing and ADR). After we turned in our first drafts, all the writers read each script and we reconvened to go over them. We talked about what worked and why, what wasn't working, how the story structure of our outlines held up (or didn't) in script form, the dialogue, the continuity of events...every possible thing you can think of. This is an amazingly helpful process because there's nothing that will make you a better writer than going over a script page by page with seven other smart colleagues (our awesome writers' assistant participated in all these sessions too). Then we all took another pass at our scripts and shipped them off to the producers and network executive for any notes they might have. You'll read a lot of sturm and drang on the Internet about getting bad notes on scripts and how awful it is, but in my experience almost all notes are helpful in some way. You're getting the perspective of people who've successfully worked on dozens if not hundreds of scripts, and while you may not always agree with what they say, you'll usually benefit from listening. After some final revisions based on notes we prepared for the next phase of the process: Turning your script in an actual episode of TV. Note: This is my personal perspective on both Z Nation and the TV business. Other people will probably have different experiences and insights because no two shows take the same path to the screen. If you work in TV and have anything to add to the discussion, leave a comment below. Also feel free to ask me questions on Twitter. I'm @craigengler.